A DBA — doing business as — is a fictitious name under which an individual, partnership, limited liability company or corporation does business. A DBA can be highly beneficial for business marketing, but setting up bank accounts in the name of a DBA rather than in the legal name of the individual or entity that owns the business can be complex and require documentation proving that you have a right to use the business name. Sole proprietors and general partners who wish to do business under any name other than their own personal legal names must register their fictitious DBA name with the appropriate state or local agency as required by their state's laws. Proof of registration of the DBA name will be required to obtain an Employer Identification Number, or EIN, from the IRS. 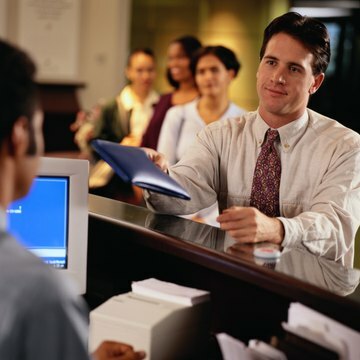 To open a DBA checking account, a sole proprietor or individuals in a general partnership will typically need to provide the bank with their EIN, business license if required in their state, general partnership agreement, if applicable, and the certificate of fictitious name registration. Limited liability companies, or LLCs, are member-owned business entities created by state statute. Like sole proprietorships, single-member LLCs don't need a separate tax ID, but can be registered under the Social Security number of the owner. To open a DBA checking account for an LLC, you will need either your Social Security number or the tax ID number of the business, along with any articles of organization or certificate of formation required by your state's laws. You typically will also need documentation that the business is presently in good standing and active in your state, along with the fictitious name registration certificate. A corporation is a legal entity separate from the individuals who form it. A corporation doing business under its own legal name does not need to file a fictitious DBA name registration, but corporations wishing to do business under a name other than the legal corporate name must file for a DBA. To open a DBA checking account for a corporation, you will typically need the tax ID number and articles or certificate of incorporation, plus a document identifying the officers if that information is not included in the articles of incorporation. For a corporation operating under a DBA, you will also need a copy of the registered fictitious name certificate. A registered nonprofit organization may qualify for favorable checking account terms at some banks, including waived annual fees and free or low-cost transactions. To open a checking account for your nonprofit organization, you will typically need to present the bank with your EIN or tax ID number, articles of organization or similar legal document, corporate charter or other document that lists the organization's authorized officers and representatives, and identification and Social Security numbers for anyone who will be authorized to write checks on the account. Like for-profit business entities, nonprofits can operate under a DBA if they registered their fictitious name as required by state law. To open a checking account under the DBA name, the nonprofit officers would have to present proof of that fictitious name filing along with any other required nonprofit organization paperwork. First Citizens Bank: What is Required to Open a Business Account?